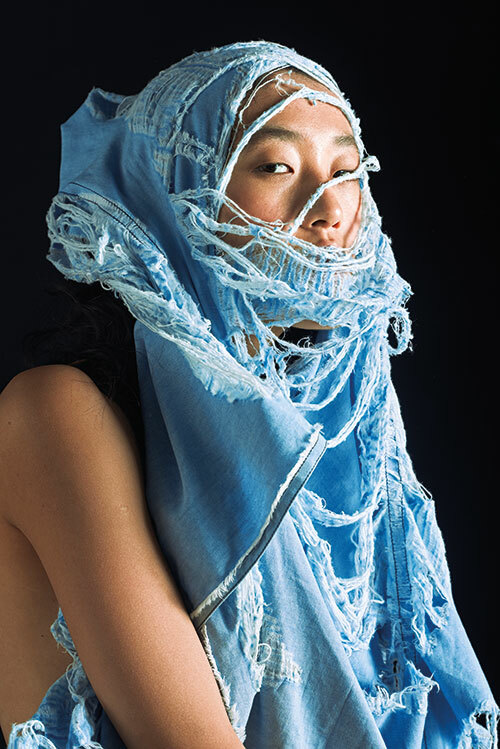 Ripped denim sari, from the Autumn/Winter 2018 collection by Diksha Khanna. Veni, vidi, vici. Denim first came into the world in the late 1700s; the cotton textile has since conquered the sartorial imagination for over two centuries, fulfilling people’s need for a durable fabric that bridges the gap between classy and grungy. Today, it is a perennial wardrobe basic and is spread over the economic spectrum of affordability and luxury. The word ‘denim’ is derived from ‘serge de Nîmes’, which translates from French to ‘fabric from Nîmes’ (a city in Southern France). The exact history of denim as it moved from the European continent onto American soil has been lost with time. Though it is commonly believed that the fabric was being used to make coarse, work pants in the 16th and 17th centuries, as the weave was both tough and comfortable. In 1873 an American tailor named Jacob W. Davis partnered with Levi Strauss (the founder of Levi Strauss & Co.) to patent the pattern for what would evolve into present-day jeans. Starting out as sturdy work-wear trousers, initially designed by Davis for miners in America during the Gold Rush, jeans gained wider acceptance with workers, cowboys and even US army men and marines who made them popular overseas. The garment went through various modifications — compositional and cultural — eventually becoming a fashion staple for both men and women. It was in the 1990s that American television shows like Beverly Hills 90210, Friends and Seinfeld made styles such as skinny, baggy, mom, frayed, overall and boot-cut, highly covetable (all of which have regained popularity in recent years), and in 2000, Time magazine named Levi’s 501 Jeans the ‘Fashion Item of the 20th Century’. Denim has been a runway and street style mainstay ever since, as designers are constantly experimenting with the fabric and putting out fresh iterations season after season. In 2015, repurposed jeans by brands such as Vetements, Re/Done and Reformation acquired a cult following and turned the spotlight on to the ‘upcycling’ of vintage denim styles. Patchwork denims, both from the Autumn/Winter 2017 collection by Doodlage. Interestingly, India too has played a major role in the evolution of this symbol of American style. Before synthetic dyes became the norm, the indigo dye used to give denim its quintessential blue shade was produced from Indigofera Tinctoria, a plant that is native to India. In fact, the word ‘dungaree’ originated in the remote Indian village of Dongri in Maharashtra, where workers and farmers wore this practical onesie made from coarse cotton. Though the potential market for denim was massive, Indian fashion was still at too much of a nascent stage to experiment with the centuries-old fabric in a credible way. In the ’70s, when jeans were shaping the rest of the fashion landscape, Indians struggled to find the right pair, as international denim brands were still unavailable in the country. That’s when the local population thronged boutiques and tailors for custom-made designs. One of the earliest establishments in the country was Mohan Singh Place in New Delhi. In business since 1969, this marketplace is renowned for its inexpensive tailor-made jeans. An influx of brands such as Levi’s (1994), Diesel (2010), GAS (2014) and other fast fashion brands in India filled the gap in the market and consumers moved to mass-produced denims. One of the oldest textile producers in the country, Arvind Mills, started making jeans in the early 1980s, and today, it is known as India’s largest denim manufacturer. All this changed in the late noughties as people began to gravitate towards home-grown, hand-stitched and sustainable fashion. Though mass retailers gave customers an array of choices, they did not modify their offerings to suit the local climate or cater to the curvy Indian body. A few young Indian labels felt the need to produce jeans that resonated with demand in the country, without losing out on their premium appeal. Our search led us to five Indian designers — Shani Himanshu, Diksha Khanna, Chandni Sareen, Kanika Jain and Kriti Tula — who are modernising the fabric with minimal cuts, native drapes and indigenous weaves. They work with fabric scraps, innovative yarn blends, unconventional washes and vintage jeans to create one-of-a-kind products that are not only helpful in reducing one’s carbon footprint, but are also uniquely Indian interpretations of this fabric from the West. On Sumaya: jacket, from the Khadi Denim collection by 11.11/eleven eleven; jeans, stylist’s own. On Tashi: jacket, jeans, both from the Khadi Denim collection by 11.11/eleven eleven. Specialises In: Khadi denims for men and women made from organic cotton and natural dyes. “When we were consulting Diesel in 2009, I worked very closely with its founder, Renzo Rosso, who actually built the whole concept of vintage and washed-down jeans in the 1980s. He said it’s what the future is about and, of course, people mocked him but he believed in that idea. Denim has a life of its own — when you buy new jeans, they are already washed down; they age on you and become a kind of second skin. In the ’80s, retailers started replicating that kind of (aged) wash on new jeans with a machine. Then the whole industry started coming in with stone washes, sand blasting and tinting. For me, denim was a blank canvas so when we were consulting for various brands (for 11.11/eleven eleven’s parent company CellDSGN) I would design a lot of those washes for various labs. When denim is made as a fabric it is always a dark indigo, hence, I call it a blank canvas. You scrape off the indigo and you wash it down. As a brand we were already working a lot with khadi as a base, and eventually the development of khadi jeans was initiated with Arvind Mills. We work with kala cotton and use 100 per cent natural dyeing processes. For 100 per cent kala cotton handmade jeans, things start with the plucking of cotton and it takes almost four months to finish. It goes through hundreds of different hands — people who pluck, spin the yarn, weave the fabric and dye…. We were the catalysts for bringing back all these different (weaving and dyeing) traditions and techniques of India and we made khadi jeans with a certain count and rate. The main idea was to work with the best craftsmen and produce something which is considered a luxury purchase. We realised that it’s a slow process — khadi is hand-spun and handwoven — and we didn’t want to fast-forward it with machine-stitching, and instead wanted to celebrate the idea of doing things by hand. For every item, we have a unique product code which can be tracked back to the beginning — where the cotton came from, who the spinners and weavers were, who dyed the fabric and who stitched it. Particularly in 100 per cent handmade garments, the person who stitched the garment signs off on it — their name is written on the inner lining. Every button is made from 100 per cent brass — we collect old coins and make them into removable buttons. All the stitching details are completely done by hand — the signature, the sizes and all the embroidery. Since there are so many stories and processes that go into creating the garments, we also design a ‘route case’ in which they are packed. The case tells you about the journey of the cotton; where it came from, to the people who participated in making that particular pair of jeans. At present we are working on a back-end system where we are uploading all the data, and where eventually, you will be able to enter this unique product number online and view the history.